Today’s been a fantastic day!! My coworker Alex (hi Alex!) offered to take me to lunch after hearing some very exciting news. We decided to go to one of my favorite lunch spots across the street from the office, Tom Douglas’ Serious Pie SLU. I’m so lucky to be in the up-and-coming food Mecca of Seattle. 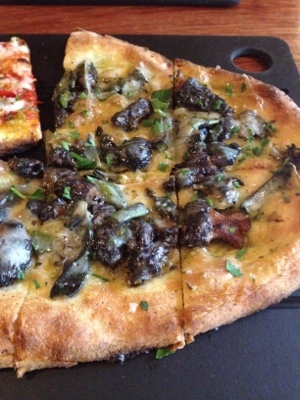 I went with a pizza with morel mushrooms, roasted onions, and fontina cheese. Absolutely divine – super gooey and flavorful. I’ve been in a total mushroom mode lately. Yum. 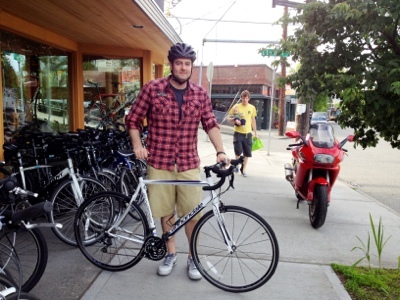 Before I forget, Joe finally decided on a fantastic new road bike from Montlake Bike Shop — a Cannondale Synapse 5 with Shimano 105 components. I’m so jealous! I recently got a Fuji bike from Craigslist that’s several years old and has older components comparable to today’s Ultegra, so still really high quality, but Joe’s is just awesome. Joe and his new shiny bike, ready to hit the roads! I cannot recommend enough the guys at Montlake Bikes. They’re so helpful and knowledgable. We went in there several times to check out the selection, ask the pertinent questions, and for Joe to test ride the bikes. They’re not based on any commission and were just totally passionate about talking bikes. I’m super excited to start incorporating long bike rides into our exercise and leisure, and who knows… some sprint-tri’s might be in our future. After getting Joe’s bike, we got ready for the very first game of the Underdog Sports Kickball League! This was my very first season and I came in being a little nervous about trying this new competitive environment out, but it seriously turned out to be a blast!! That’s one good-looking (and winning) team right there! We did awesome to start the season off. I think the score was something like 14-2? Yep, beastly. 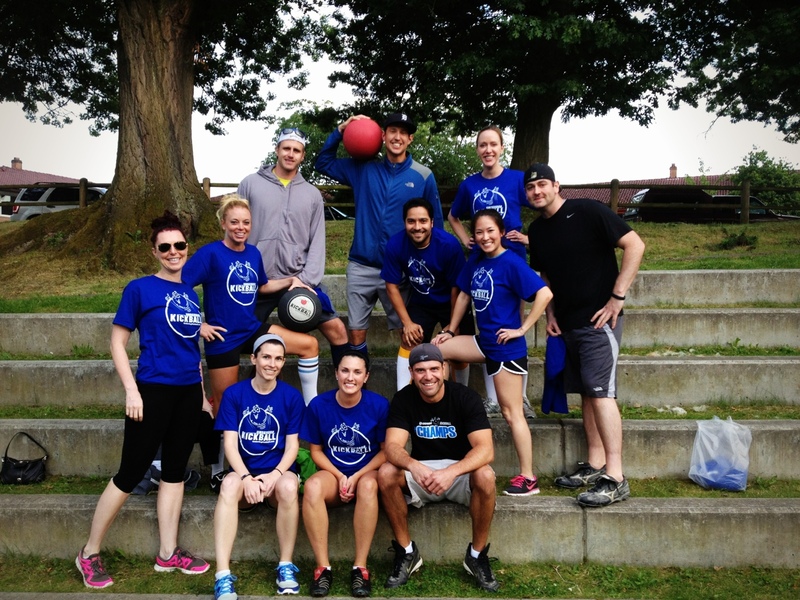 Kickball is actually a really great workout. You’re constantly moving, running, catching balls, etc. I look forward to tons of fun games and then enjoying a few brewskies afterwards. Happy Summer Solstice everyone! Get some sun while we (Seattle) have it.